The HP Z240 packs the performance, features, and reliability of a workstation into the price point of a desktop PC. Powerful processors, graphics, memory, and two optional ultra-fast HP Z Turbo drives2 give you the level of performance you need to push boundaries. Take on challenging tasks with confidence with up to 64 GB DDR4 ECC memory and 4.2 GHz of processing power3. HP keeps you running 24/7 with our three-year warranty, on-site maintenance and support and optional HP Care. 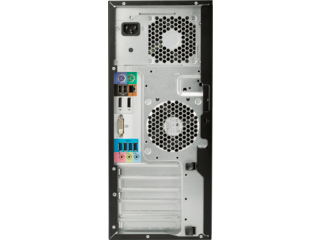 At 57 percent smaller than the tower, the HP Z240 SFF conserves space and maintains workstation performance. And with HP's no compromise reliability, your HP Z240 is designed to work today and well into the future. Get more capacity, performance and reliability with up to 32 GB DDR with optional ECC memory. Help your HP Z240 Workstation perform at its peak with an optional, removable, and cleanable dust filter that helps your workstation's internal components stay clean and cool. Get premium graphics performance with a choice of AMD and NVIDIA professional graphics cards ranging from 2D to high-end 3D on some configurations5. Each drive requires a PCIe x4 (minimum) slot to be available. Full performance is obtained only when using PCIe slots connected to the CPU. Non-CPU PCIe slots may see a decrease of up to 10%. Please see slot configuration recommendations at http://www8.hp.com/us/en/campaigns/workstations/z-turbo-drive.html. Note that graphics cards, Thunderbolt™, and other devices will require PCIe slots. Some 3D graphics only available as AMO and are not available on small form factor configurations. Intel and Xeon are trademarks of Intel Corporation in the U.S. and other countries. NVIDIA and Quadro are trademarks and/or registered trademarks of NVIDIA Corporation in the U.S and other countries. 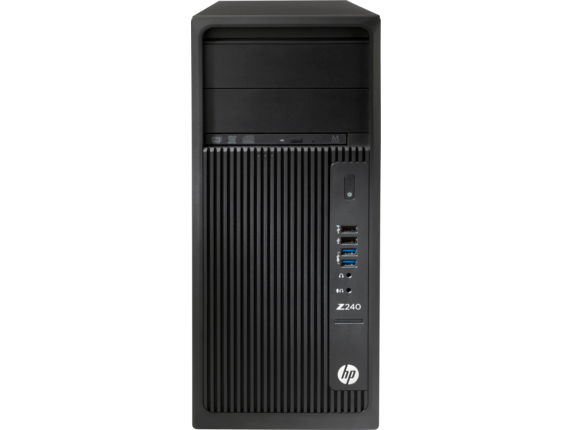 With a range of options from the slim and powerful small form factor desktop to high-powered and easily upgradable tower models, the award-winning HP Z240 family of workstations is a great fit for any professional setting. 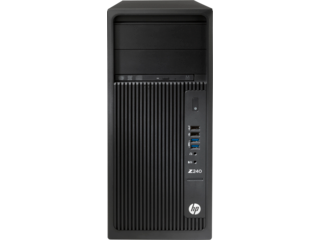 Whether you need an affordable model you can scale up with your new office over time, or a dependable cornerstone to build your work around, there’s an HP Z240 that’s perfect for you. It’s never been easier to plan for the future with a desktop that offers such unparalleled freedom of choice. Want to start with a cheaper option but worried about coming up short on features later? Not a problem, because the Z240 family is designed with you in mind. Start small and then upgrade if and when you need to do more with your system. Easily add more capacity yourself, or even search within the line’s performance options if you decide you need to make a bigger leap. Every HP Z240 is designed with a variety of roles in mind, so every model is designed for its own niche - providing exactly the right power and durability for any scale or scope. The line even incorporates serious computer accessory and peripheral features, like an easy interior layout for when you need to upgrade and an optional filter insert to protect against dust. The extra protection is a small price to pay for peace of mind and it couldn’t be easier to maintain - just remove the used filter and replace after cleaning. With so much attention to detail given to each model, you’re sure to find a great fit for you. 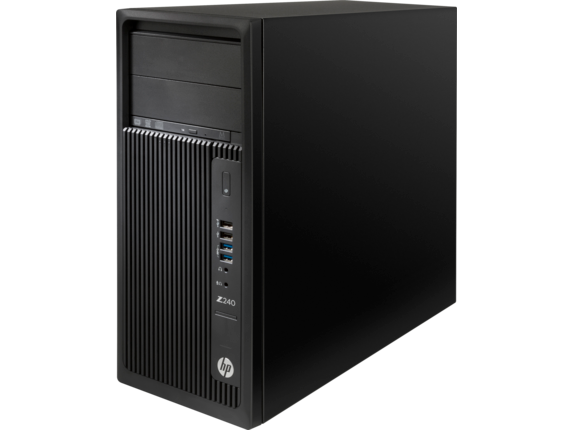 After all, these features and more have consistently made the HP Z240 family among the world’s bestselling workstations. 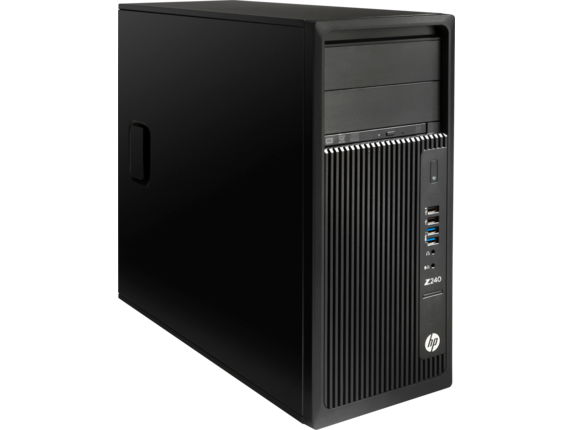 If you’re looking for an easy way to boost your business desktop computing to the next level, the impressive performance and low price point of the HP Z240 small form factor models is unbeatable. The HP Z240 offers between 8 and 16GB DDR4-2133 built-in memory options with plenty of room to make your own upgrades in case you ever want to add capacity. Start with an Intel® Xeon® E3-1240v5 processor and NVIDIA® Quadro® K1200 (4GB) graphics card for our more affordable first entry model. Or you can move up to a powerful Intel® Core™ i7-6700 processor with Intel® HD Graphics 630. Even with that kind of performance guaranteed, you still need a solution that can fit easily into your routine and unique workplace. Measuring in at a surprisingly compact 13.3 x 15 x 3.95 inches, the Z240 small form factor workstation is less than half the size of our larger, more customizable tower model - nearly 60 percent smaller, to be exact. Everything about the Z240 is designed for convenience and staying power, and it comes in a package that looks good and fits smoothly into any office space. It’s even priced to move with a versatile, premium option at the price of an average desktop. For a truly long haul business computing solution, the HP Z240 workstation is an option that won’t let you down at any stage of your business. Our tower options set the standard with an unbeatable price range while offering numerous options to maximize performance and durability. 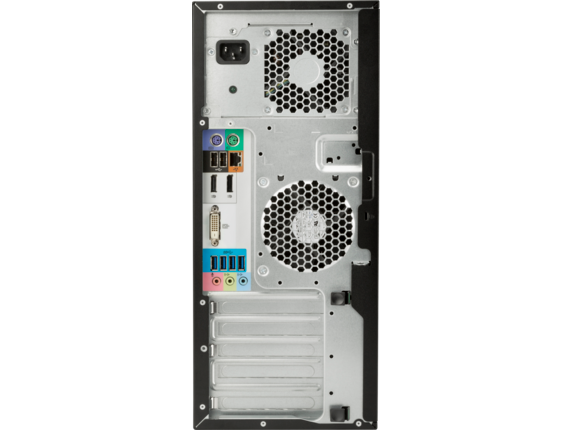 With support for up to 4.5 GHz of high-performance processing power and room for two optional high-speed HP Z Turbo Drives, the Z240 tower is an award-winning and ISV-certified benchmark in its class. Need an affordable tool to build your setup around over time? The HP Z240’s cost-effective entry option is a rugged starting point with plenty of room for upgrades. Or if you want to skip a few steps ahead, pay a little extra for even more impressive starting features like 16GB of DDR3-1600 SDRAM and a powerful HP Z Turbo Drive 256GB PCIe solid state drive that never leaves you in the lurch - and, of course, there are ample upgrade options, too. Start every day of work off right with a Z240 tower, HP’s most affordable workstation, that comes loaded with Windows 10 Pro. From day one you’ll have access to a massive suite of management tools including a remote login function and lockdown tool to protect your data in case of theft, as well as a cloud-based backup drive that can also be used for sharing or teamwork. 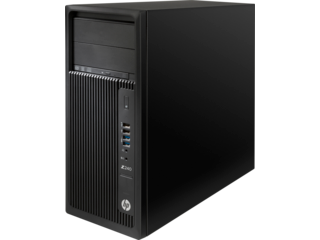 The hidden advantages of each HP Z240 workstation are in its careful design for constant ease of use and the included space for customizing your workstation. And on top of that, you get the basics you can count on from every one of our business solutions. Need the absolute most in power and performance? Pair an HP Z240 with the HP Z Turbo Drive G2 512GB PCIE SDD or dual HP Z Turbo Drives for topshelf processing power and seamless, lag-free computing. Are complex graphics and visualizations a concern? Pair your HP Z240 with a powerful NVIDIA Quadro M4000 graphics card for crystal clarity across your displays. Each HP Z240 is also built with a compact Slim SATA DVD-ROM drive to allow for even more room to expand. With Energy Star® certification and a design that was crafted toward efficiency, the HP Z240 series is low-impact on your utility bill despite its high-powered performance. Purchasing a new workstation is a serious investment no matter if you’re buying one for a home office, or a batch of them for your growing business. That’s why we offer a three-year warranty covering parts, labor, and even on-site service just in case an unexpected disaster strikes.